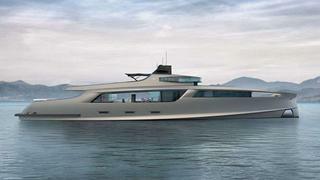 Back in August, Esenyacht announced plans to build a 50-metre composite motor yacht by Mannerfelt Design of Sweden. Now the Turkish builder has released the renderings of the 50-metre superyacht project, which can be seen here at Boat International first. Speaking of firsts, the 50-metre Taurus represents a departure for Esenyacht, renown for building sailing yachts, as its entry into the motor yacht market. The composite-built 50-metre superyacht's open interior spaces will bask in light flooding through large windows, while the exterior styling is sleek and low, inspired by Ted Mannerfelt’s background in automotive design with Jaguar. The exterior profile is low, sleek and futuristic, with large windows running the length of the saloon and opening to let the interior enjoy not only natural light but a wonderful cross breeze. The glass-encased, brow-like flybridge is perched above, and aft of this is an open sun deck. Additional images showing further details of the new Esenyacht Taurus will be revealed at the Qatar boat show this November. Meanwhile, Esenyacht’s 47-metre sloop-rigged sailing yacht Troy is due to launch in early 2015.